It will come as a complete surprise when I tell you that I have recently taken up cake baking. At this stage any plans to become a candlestick maker have been put on hold. You will note I said cake baker not cake maker. The intricate elements of the cakes I have been producing have been carefully put together by an ageless American lady named Betty Crocker. It’s a very simple process. To Ms Crocker’s magic mixture I merely add a few eggs, some oil and water - oil and water apparently do mix - and then into a pan and into the oven. 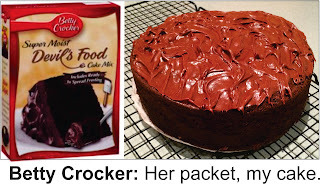 The remarkably clever people at the Crocker factory even supply ready-made icing in a tin foil packet and the end product makes me look as though I have been a master baker all my life. 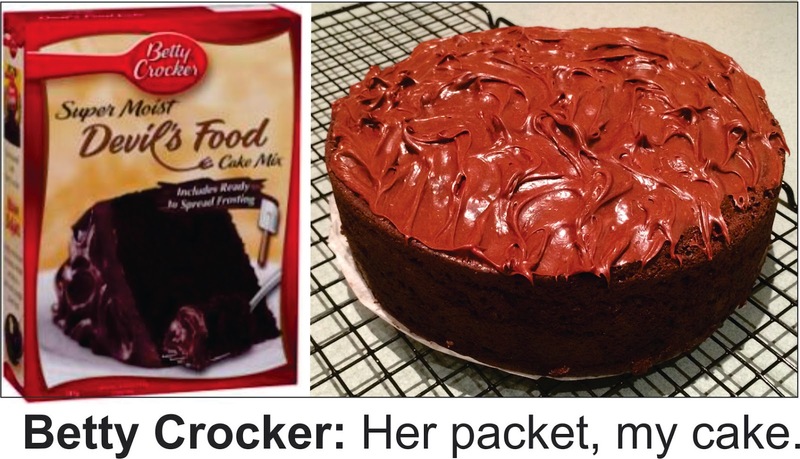 My initial venture into cake baking occurred when my wife’s shopping list had just three items on it. She’d been to the supermarket a couple of days before and these items were left off at the time. I agreed to go along for the ride. She didn’t notice me furtively dropping an enticing packet of cake mix into the trolley and when she discovered the legerdemain she suggested that I make it. Now I’ve got the bug. I like supermarkets. Whenever we go on holiday, rather than look at the local items of interest as outlined in the glossy brochures, I inevitably make a beeline for the nearest supermarket. It’s true I spend an inordinate amount of time at the meat display, but I find the whole premise exhilarating. I am in awe of the marketing tools that these maestros employ to extract the major portion of what we have come to know and love as our discretionary income. On this visit I wanted to take one of the little green plastic baskets at the door to carry the three items. The management hate this. I’ll swear they actually glue these baskets together so that eventually you give up and take the trolley. This is a fatal mistake. At the checkout the three items we had gone in for had expanded to thirteen. The majority of the extras, I confess, I had tossed into the trolley myself, including of course Betty’s attractively packaged Devil’s Food cake mix. I’m a sucker for impulse buying. I asked the lady at the checkout would she mind if we just paid for the three entries on the original shopping list and although she was empathetic, company rules forbade her to show any fiscal compassion. Certainly, without exception, the ten items fell neatly into the last category; particularly the cake mix. Lately we’ve been told, as if we didn’t already know, that as a nation we are eating ourselves to death. We are heading for an obesity problem and an attendant diabetes epidemic that will stretch our health funding resources to the limit. Blame is being laid for this situation on fast food outlets and, surprisingly, state-owned television, which regularly screens advertisements promoting fat-inducing convenience food. And now sugar is fast becoming public enemy number one, ahead of Class A drugs and possibly even homicide. I’m surprised that amongst all this criticism and blame-laying, supermarkets get let off the hook. If not the supermarkets as such, then at least the clever branding and marketing people who have come up with such compelling packaging that it’s well-nigh impossible to exit the premises without your shopping list being compromised. When I was a kid obesity was only a problem for those who had a “glandular condition,” or so we were told. Our grocer’s shops had fewer products back then and most items on the shelves were in bland brown paper bags with the product name and price marked in indelible pencil. The groceries were out of reach behind the counter and the grocer usually took your list and checked it off himself. Occasionally he might suggest another product not requested, but mostly he complied with your requirements as quickly as possible so he could personally serve the person patiently waiting behind you. Today we serve ourselves and are totally undisciplined. We are bombarded with choices and a product range we once would only have dreamed of. No attempt is made to divert the bouquet coming from the bread being baked on the premises or the enticing smell from the rotisserie chickens sitting temptingly in a strategically-placed heated display unit. This aroma, when mixed and dispensed judiciously so as to permeate the whole store, is so persuasive that your wallet becomes captive to all food items within reach. The seduction is complete when, having reached the limit of your credit card account, the checkout operator then offers you more cash out of the till! All of this is a classic example of the trickle-up theory that governments don’t want you to know about. While you’re pleading with your bank manager to increase your overdraft limit so you can get in some more food supplies, the manufacturing and marketing gurus, living in the leafy suburbs in the North, are having no problem whatsoever coping with Auckland’s burgeoning house prices. I might go up there and open a cake shop. Should we flag the flag debate?